Christmas is finally here! That beautiful season of the year in which joy, solidarity and the desire to go out and walk the streets, maybe do some shopping or just enjoy yourself with family or friends… No doubt Malaga is the ideal place for that. The perfect city to live Christmas, with a pleasant weather that allows us to go out and make the most out of this holiday season. We love Christmas in our hostel in Malaga that is why, at Alcazaba Premium Hostel we have gathered for you the best Christmas plans in Malaga. Enjoy the holidays with the kids, or shopping, or simply enjoying tradition and local gastronomy… There is something for everyone! If you have children, nephews or children around you, surely you are already thinking what to do this season they have been waiting for all year. Find all kinds of activities for children in the MIMA (Málaga Children’s Show): children’s musicals, workshops, leisure and sports activities, ice rink, karting … These are some of the activities you can find at the Trade Fairs and Congress Center of Málaga from December 26 to January 4 from 11:00 am to 9:00 pm. Are you into cribs? 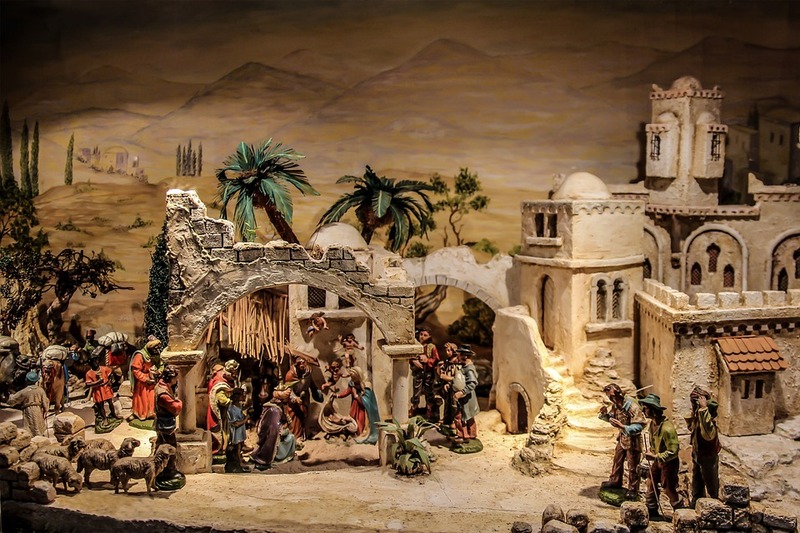 There are more than 50 nativity scenes in Malaga: a great route to discover the different versions of the crib of Bethlehem. There are of all sizes and styles and some of the most popular are: the municipal nativity scene that is exposed in the Town Hall; the one from La Mosca, a singular district of Malaga that exhibits a great crib in a natural setting, or the nativity scene of La Concepción, set up by the workers of the botanical garden. All are open during the month of December and until approximately Three Kings Day (Epiphany Day). A must-see event: the parade of the Three Wise Men. On the afternoon of January 5th, just a few steps from our hostel in Málaga, the children will finally meet the Three Wise Men, accompanied by floats, music and, above all, many sweets! If you like to go shopping surrounded by the magical atmosphere of Christmas, do not miss the Christmas stalls of Paseo del Parque, located between the port and the Alcazaba of Malaga. Cribs, firecrackers, cotton candy, waffles, costumes, gifts of all sorts… All the charm of Christmas in a single street so you do your last-minute gift shopping! One of the most popular festivals in Malaga takes place right in the middle of Christmas. The Fiesta Mayor de Verdiales (a local sort of fandango music style) is celebrated every year on December 28 in the fairgrounds of Puerto de la Torre. A contest in which the different “pandas” (groups) of verdiales from Malaga are brought together by styles and compete throughout the day. Feel the mythic folklore from Malaga: tambourines, singing, dances, flags … you will feel hypnotized with the palm hats decorated with coloured ribbons, mirrors, flowers and beads. Live this popular custom with the locals in an unforgettable experience; pure tradition and joy. The city’s shopping centres hold every year some of the most entertaining and original activities for the entire family. In Muelle Uno, for example, you have Santa’s house where the little ones will be able to meet the great red king of Christmas and the starfish, whose light is activated by the pedalling of the visitors on their three built-in bicycles. In addition to all this, you can enjoy workshops, storytelling and concerts. In Fuengirola, at Parque Miramar, you can visit Santa Claus until December 24th or enjoy the ice rink on the terrace of the shopping centre. Finally, in the Christmas village of El Corte Inglés, your children will be able to enjoy various attractions, such as the rally, the carousel, Snow City, the ice rink, the Christmas train or the sled. In addition, they have prepared storytelling, magic and puppet shows, as well as craft workshops, face painting and balloon twisting. You still don’t know what to do on New Year’s Eve? One more year, Alcazaba Premium Hostel dresses up in New Year’s Eve to bid farewell to the year in the heights. Our restaurant Batik wants to surprise once again you by preparing a delicious special Christmas menu for such a special night. And afterwards, an elegant party with cocktail and drinks, you can go up to our chill-out terrace and enjoy the wonderful views to welcome the year in an incomparable atmosphere. You no longer have excuses not to live the real Christmas in Malaga. Of course, do not forget to take a break between the activities to replenish forces … and do it in the heights in our chill-out terrace right in the city centre next to Malaga’s Alcazaba. Season’s greetings to all!